The menu is divided into antipasto, primo piatto and secondo piatto. There's nothing to stop you ordering just one, or all three or an antipasto and a primo etc. One potential diffi­culty (at least for me) is that a primo on its own isn't enough, but a primo plus a secondo can be too much. And sometimes the primo is a meal in itself. If you're not sure there's nothing to stop you ordering a primo and then seeing how big it is when it arrives, or if you still feel hungry when you've eaten it. Of course ordering a pizza is another way to get round the problem. If you are travelling with other people there’s nothing to stop you sharing dishes especially antipasti and contorni (side dishes) - you can order two plates. Some restaurants offer a selection of antipasti - this might be called antipasti della casa, selezione da degust­azione or something similar. This is a great way to try a bit of everything - but it can often be a meal in itself. A bargain, but maybe wait to see how much you get before ordering another dish. Vegetables are usually served separ­ately as a contorno. Some Italians will eat the secondo of meat without any contorno, while others will eat the contorno as a separate course and others alternate between the two. 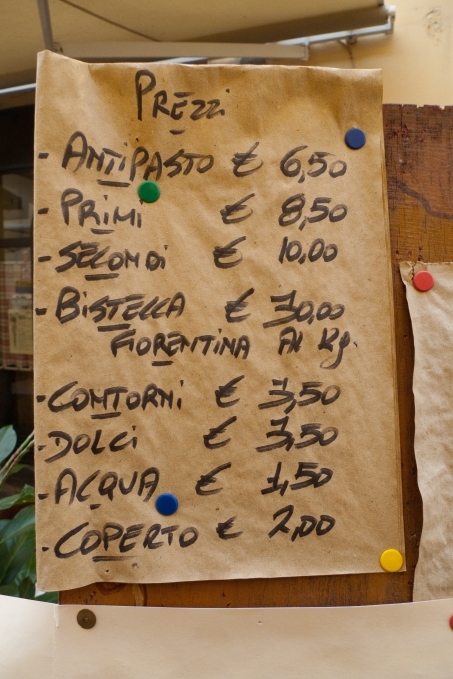 Some restaurants offer a menu fisso (or menu di lavoro or menu operaio) especially at lunch­times. This usually means that you get to choose from a limited set of options (sometimes one option) for a fixed price. If you are a tourist, you may find that you are simply offered the normal menu- if you want the fixed-price menu you may need to ask. The problem for travellers (or at least for me) is that the waiter will usually tell you what the options are and by the time you've registered the last option, you've forgotten the first one. One option might be to get out a piece of paper and write them down. If you go into a restaurant you will generally find the table set with a knife and two forks. The fork for eating the pasta, and the knife and other fork for the secondo. In most places, if you order and antipasto that you eat with a knife and fork people normally hang on to the knife and fork (although in posher places they will normally change them). Italians would never eat pasta with a fork and a spoon - still less cut up the pasta with a knife and fork - but the restaurant will happily bring you one if you want one. 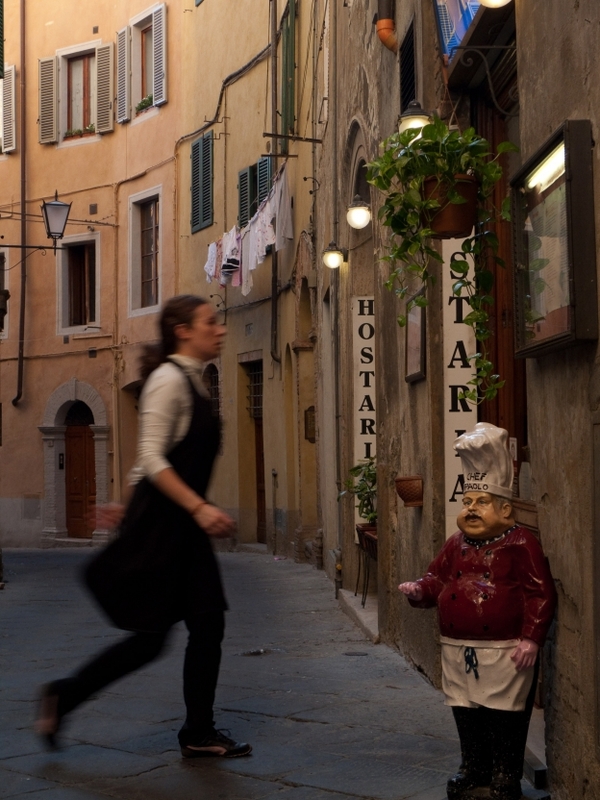 One of the many mysteries of Italian life (at least for foreigners) is whether to ask the waiter to bring you the conto (bill) or to pay at the cash desk on the way out. The posher the restaurant the more likely they are to prefer to bring you the bill at the table, but getting up and paying at the cash desk is generally quicker. You can generally expect to pay between 5 and 8 euros for an antipasto (or between 10 and 12 if you order a selection). For a primo between 6 and 8. For a secondo between 10 and 12 euros - although something like sausages will be less and a steak about 14. Posher places, and places in tourist areas may well charge more. A dolce will be about 4 or 5 euros. A quarto (quarter litre - a couple of glasses) of house wine will be about 3 euros. A glass (calice or bicchiere) of better wine will be the same or even a bit more. A bottle of inexpensive wine about 10 euros or so - sadly very few restaurants offer half bottles. Expect to pay 20ish euros for a dinner/​lunch with a couple of courses. 30ish if you go for a secondo. The general practice in Italy is to charge a couple of euros or so for a cover charge - coperto e pane. This is a service charge and generally people don't tip (although you may well round up the price - or occasionally the restaurant will round it down). Please get in touch if you find any errors in the information, or if there’s anything, good or bad, that you’d want other cyclists to know. If you’ve found this site useful why not sign up to the mailing list for occasional updates about new routes.